1. When did the term "Art" get applied to martial studies? 2. Do Koreans call TKD an "Art"? The term “art” in “martial art” doesn’t mean “aesthetics,” as it is often suggested. The word comes from the old French “ars,” which means craftsmanship and was adopted into English to mean skill, particularly of something that needs to be practiced, hence the related term “artisan.” Thus, martial arts simply mean ‘war skills’ (“martial” from Mars, god of war; “arts” from ‘ars’ [old French], meaning craftsmanship, skill). In Korean there are three terms that is usually translated into English as martial arts: “musul 무술”, “muye 무예”, and “mudo 무도”. The base term “mu 무” (from the hanja: 武) translates to roughly “martial” (“martiality”). The suffixes “-sul 술”, “-ye 예”, and “-do 도” translate as “skill”, “art”, and “way” respectively. Since “art” in the English term “martial art” means “skill,” the closest Korean equivalent is “musul”. Interestingly, the “art” in “muye” actually does have a stronger aesthetic connotation in Korean; while “martial art” in English is actually more about a practiced skill, the Korean term “muye” is more about a creative skill. The preferred term in Chinese for martial arts is “wushu” 武術, which is the same as “musul” in Korean and “bujitsu” in Japanese; i.e. martial skill. In Japanese, the term “budo” has become preferred for their (modern training of) martial arts and corresponds with the Korean “mudo”; i.e. martial way 武道. Which is the Korean preference? Korean traditionalists typically use the term “muye 무예” (hanja: 武藝 ) in their writing. This point was brought up specifically by the professors at Kyunghee University (Korea) where I did my PhD. The ancient Korean martial art texts have “muye 무예” in their titles: Muyejebo (1598), Muyejebobeonyeoksokjip (1610), Muyesinbo (1759), Muyedobotongji (1790). 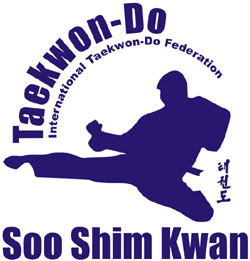 A modern example is Taekkyeon practitioners who refer to their style as “our [Korean] martial art” (uri-ui muye 우리의 무예) in their writings. Even General Choi, when he described Taekwon-Do as the “Korean art of self-defense” literally called it “hoshin yesul 호신예술” (i.e. the art [creative act] of self-defense). 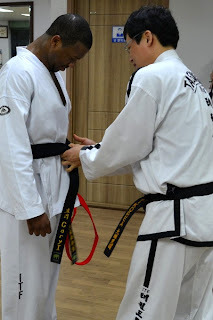 Second, the terms “musul,” “muye,” and “mudo” are sometimes used to suggest a practitioner’s growth on the martial arts journey, starting with a basic acquisition of techniques (“musul”), to a creative improvisation of techniques (“muye”), to a spiritual discipline where lessons learned in the dojang is intuited to life wisdom (“mudo”) beyond fighting. I’ve written about this here on my blog, and Dr Johnson has also written academically about it. The English term “martial art” is better understood as “war skills”. 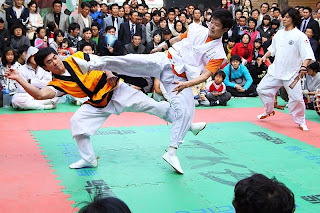 Koreans have three terms for martial arts: “musul,” “muye”, and “mudo.” All three terms can be used and often are used interchangeably by Korean speakers. Although lay people often use “musul,” “muye”, and “mudo” as synonymous, the term “muye” is typically employed by Koreans to refer to traditional Korean martial arts, differentiating it from the Chinese “wushu” (“musul”) and the Japanese “budo” (“mudo”). The terms are also sometimes applied to indicate a person’s progression along the martial arts journey, with “musul” referring to the foundation level or technical training and “mudo” implying ascetic self-development. Koreans who practice martial arts as a way of life refer to themselves as “mudo-in 무도인” (literally: martial-way-person).